Mom suggested we try one of these based on this WaPo article she read. Great idea, Mom! I also got some inspiration from this YouTube video. These are like crêpes you can’t screw up. My desserts have a tendency toward heaviness. I think that’s why I enjoy mousse so much. If there’s anything in which heaviness is an unacceptable attribute, it’s a mousse. And as much as I enjoy chocolate mousse, I liked the idea of a citrus flavor more for warmer weather. And as it happens, it’s simpler to make than chocolate, too. The inspiration comes from Thursday Night Smackdown and the gorgeous pictures over there, but we used our own lemon curd recipe and halved the whole thing. Follow the link for the original, the steps I took are below. Using whisk attachment, blend together curd and mascarpone on medium speed until smooth and well-combined. Whip cream and gently fold into curd mixture. Divide into serving dishes and chill at least 4 hours, but consume within 36 hours. Serves 4-6. *If you want to be really fancy, pass the curd through a fine mesh strainer to get a smoother product. We don’t bother with this, but we’re pretty lazy. 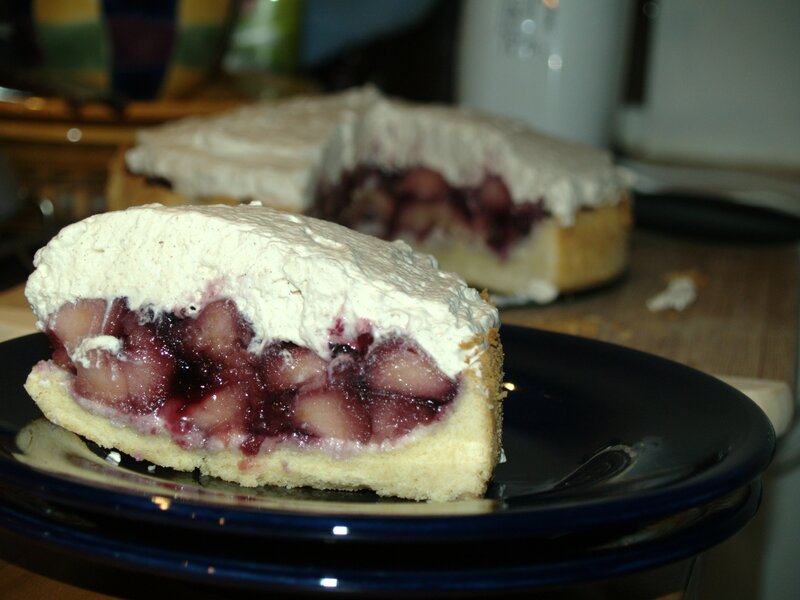 If pie ≈ Kuchen and Kuchen ≈ bread, then bread ≈ pie? And how does Torte figure in here? Sarah’s been experimenting with crusty baked goods lately, ever since she got back from Poland with some equipment. We’ve shied away from pies, quiches and tarts our since having moved to Germany because of the crappiness of the oven in our old place. Now that that’s no longer an issue, we’ve got another desserty avenue to explore and share with the locals (which I often do at work). But, were I to bring in a cherry pie to share (last night’s test run was definitely worthy), what would I call it in German? dict.leo.org suggests Kuchen for pie. I would have guessed Torte, I suppose, but maybe my concept of tarts and tortes is off. And if pie translates to Kuchen, and the pumpkin/banana/zucchini bread I bring in to share counts as Kuchen what does that imply about pie’s relationship to bread? Should just give up and introduce it as “Cherry Pie” and be done with it? I am sure this is one of those math things. 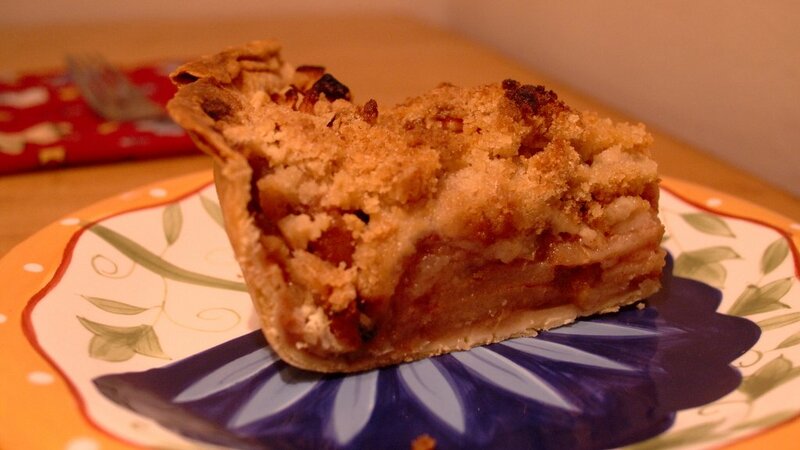 Posted on March 25th, 2009 Author cliff1976Categories UncategorizedTags dessert, German, grub, language10 Comments on If pie ≈ Kuchen and Kuchen ≈ bread, then bread ≈ pie? Welcome to the lab! We reverse-engineered this cake from one that we bought in a bakery when a couple of friends were coming over for dinner. Any leftover syrup would probably be wonderful on vanilla or dark chocolate ice cream. It’s pretty simple, but labor and time intensive – don’t make it the same day you want to serve it. It gets better as it chills. Bring wine, water, sugar, cinnamon, ginger and lemon zest to a boil in a stockpot or large Dutch oven. Add apples to wine and lower to a simmer. Cook for 20 minutes or until apples are tender. 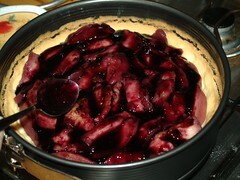 Remove apples with slotted spoon to cool in a bowl and set aside. Keep wine at a low boil and cook down to a syrup (45-50 minutes), stirring constantly. When the apples have cooled (1.5 to 2 hours), slice them into bite-sized pieces. Preheat oven to 350° F (175° C). 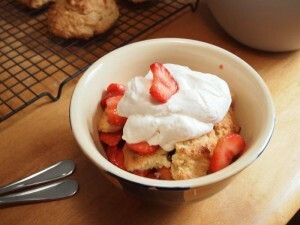 In a large bowl, cream butter and powdered sugar until light and fluffy. In a separate bowl, combine flour and baking powder and blend into butter mixture until crumbly dough forms. In a greased 9- or 10-inch springform pan, pat dough on to bottom and sides to 1/4 inch thickness. Bake for 12-15 minutes or until edges are golden. Set aside to cool. Pour cream into chilled bowl and beat on high speed. Slowly add sugar, cinnamon and vanilla. Pour sliced apples into cooled shell and drizzle with wine syrup (don’t feel you have to use it all – you don’t want it to soak through the crust and get soggy). Spread whipped cream on top of the apples and refrigerate for at least 4 hours before serving. I started with this recipe but quickly made it my own thing. Preheat oven to 350°F. Butter the cups of a mini-muffin pan and put a half a centimeter of graham cracker crumbs in the bottom of each cup; set aside. Cream egg yolks, sugar, vanilla, sour cream and cream cheese until fluffy. Beat egg whites until stiff; fold into creamed mixture. Got inspired to try this one after Carolyn and Max sent over some links to the Food Network’s “Good Eats” show on YouTube. I’d read others’ raves about Alton Brown and the show, and I guess it’s a good thing I haven’t discovered the show until now. Neat stuff to be seen, then prepared, then enjoyed. As usual, there are some recipe fluctuations to be had here, due to availability of ingredients and the particulars of our kitchen. I’m posting our adaptation, but you should compare it with the original if you’re interested in the famous version. Generally we try to stay true to the original, but sometimes that results in less than appetizing results. There was a learning curve on several fronts in effect. That’s part of the reason why it took us ALL FREAKIN’ DAY to hack up that coconut, make the cake, let it cool, hook up the frosting. And the icing on the cake — so to speak — is that we can’t fit the cake in our cake transporter into the fridge to cool off. It (the transporter, not the cake itself) is too big. So our cake won’t get the chill it richly deserves before we try it out for dessert tonight (and breakfast tomorrow?). Oh, and speaking of breakfast tomorrow: if you have to tap into a new can of coconut cream just to make this (or another recipe) and end up with some left over, fear not! Substitute it in for cream for a delightfully tropical twist to your morning coffee. On with the show! 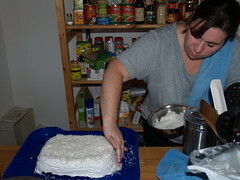 1/2 cup fresh coconut cream (we used canned stuff) — not to be confused with Cream of Coconut! Cook’s Note: To open a coconut: Preheat the oven to 375 degrees F. Place the coconut onto a folded towel set down in a large bowl. Find the 3 eyes on 1 end of the coconut and using a nail or screwdriver and hammer or meat mallet, hammer holes into 2 of the eyes. Turn the coconut upside down over a container and drain the water from the coconut. Store the water in an airtight container in the refrigerator for up to a week. Place the coconut onto a 1/2 sheet pan and bake in the oven for 15 minutes. Remove from the oven. The coconut should have cracked in several places. Using an oyster knife or other dull blade, separate the hard shell from the brown husk. Using a serrated vegetable peeler, peel the brown husk from the coconut meat. Rinse the coconut meat under cool water and pat dry. Break the meat into 2 to 3-inch pieces. With the grater disk attached to a food processor, grate the coconut. That SO didn’t work as planned. We didn’t get nearly as much coconut water as expected out of ours. The recipe calls for one coconut and 1/3 cup coconut water. I reckon we got a couple tablespoons, max. And that was after selecting the single juiciest-sounding coconut at the store. Baking the coconut as instructed yielded no cracks to speak of and I absolutely couldn’t wedge a cheap, blunt, old knife into the outer shell. It just wouldn’t work. So we had to resort to the web. Thankfully, Sarah found this guide to bashing open a coconut. Method #1 worked for us; which is good because we don’t really have any concrete steps or curbs to do our prep work on. The hopper on our food processor lost its plunger a ways back due to mysterious cracks. Consequently we’ve been grating stuff in our food processor with either the weight of the food-to-be-grated as the downward force or by carefully grinding it (carrots for example, when we’re making plov) down as far as we we dare skewered on the end of a fork. That was tricky this time because of the density (lower than a carrot), flexibility (moreso than a carrot) and shape (less fitting to the shape of our hopper) of the coconut flesh pieces. Somehow we managed to get it done, but there was a fair amount of coconut strewn about the kitchen. Preheat the oven to 350°F. Grease and flour (or just use Baker’s Joy and revel in it!) a 9×13″ baking pan. Set aside. In a separate bowl, whisk the egg whites until they form stiff peaks. Fold the egg whites into the batter, just until combined. Bang the pan on the counter top several times to remove any air and to distribute the batter evenly in the pan. Place in the oven on the middle rack. Bake for 40 minutes or until the cake is light golden in color and reaches an internal temperature of 200°F. Cool the cake in the pan for 10 minutes then remove and transfer to a cooling rack. 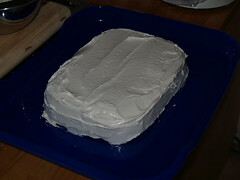 Once the cake has cooled completely cut across the equator to form 2 layers. Place the 1/3 cup coconut water into a small spritz bottle and spray evenly onto the cut side of the 2 layers. If you do not have a spritz bottle you may brush the coconut water on with a silicone pastry brush. We didn’t have enough coconut water to do this part at all. Allow to sit while preparing the frosting. Bring 1 quart of water to a boil in a 4-quart saucepan over high heat. Decrease the heat to medium to maintain a steady simmer. In the meantime, place the egg whites, sugar, coconut water, cream of tartar and salt into a medium size-mixing bowl. Place the bowl over the simmering water and immediately begin beating with an electric hand mixer set to low speed. Beat for 1 minute and then increase the speed to high and continue to beat for 5 minutes. Remove from the heat and beat in the coconut and vanilla extracts for 1 minute. Allow the frosting to sit for 5 minutes before using. Place approximately 3/4 cup of the frosting on the first layer of cake, sprinkle with 1/2 cup coconut and top with the next layer. Repeat until you reach the top layer. 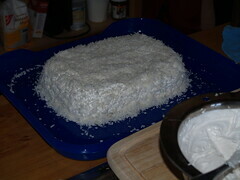 Frost the top and sides of the cake and sprinkle with the remaining coconut. Refrigerate for at least 30 minutes before serving. OK, as mentioned above we couldn’t get our cake to fit in the fridge to chill and with the weather recently an outside chill is also not an option. Maybe this cake is a better winter option for us just for that reason. We could have maybe sliced our single layer rectangle in two pieces to create a layer and use up our extra frosting that way (and why oh why do we habitually have about twice as much frosting as we need?! ), but we definitely wouldn’t have had enough coconutty fluffy love to spread around two layers. Therefore: next time TWO coconuts suffer the vengeful wrath of the blunt side of my cheap Chinese cleaver — and maybe we’ll get enough coconut water out that way — and maybe we’ll get someone to smuggle some coconut extract into the country for us (100ml is still carry-on-safe!). And then we can try this whole thing again from the start. 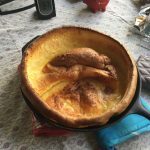 This one gets the record for shortest duration from the point of recognizing the need to delivering a finished product — mostly because we had all the ingredients at home at the ready. We’d had a big jar of peaches sitting around for a long time, with no usage planned. Then reservations at the restaurant for this evening fell through and we scrambled to find another place to eat with only 2 hours notice. We conferred with our fellow diners and decided to head over to their house for dinner (nice of them, right?). And they asked us to bring something sweet. But after the success of the Bleu Cheese Crisps (those were super easy too), I whipped open that same cook book looking for something in the desserts section with “Easy” in the title. “Easy Peach Cobbler” — there’s our winner. Melt the butter in a 9×13-inch baking dish. Blend flour, milk, and granulated sugar; blend well. pour mixtrue on top of melted margarine. Do not stir. Place undrained can of peaches evenly on top of mixture. Do not mix. Bake at 450°F for 20 minutes. Serves 6. Perhaps we can get our guinea pig focus group to comment directly, validating my own sense of pride in the practicability of this recipe. P.S.– If you notice this post disappear later this evening, it means the Easy Peach Cobbler didn’t deliver all that it promised. I was tasked with finding a dessert for the grill party this past weekend. I thought we might have something that would work in the recipes already posted, but it has been witheringly hot for the past several days and the vast majority of our posted desserts are, of course, chocolate. Which is great, but not when it’s 90° and humid. So I started searching for strawberry recipes and I found this. We gave it a whirl earlier in the week and were blown away, so we did it for the party, to great acclaim. I’ve made a couple of alterations (like drastically cutting the sugar content), so I’ll post my adjusted recipe here. It looks complicated, but it comes together quite easily. Preheat oven to 425°F (218°C) and line a cookie sheet with parchment. With knife blade attachment on food processor, process flour, baking powder, salt, brown sugar, butter and 2 teaspoons granulated sugar until mixture resembles coarse meal. Pour mixture into medium bowl. With wooden spoon or paddle attachment on electric mixer, add milk and mix just until it forms a smooth dough. Scoop dough onto cookie sheet in 6 equal mounds. Bake 15 to 20 minutes or until golden brown. Remove from oven; transfer to wire rack and cool. In a bowl, mash half of the sliced berries. Add sugar and vanilla and stir. Chill mashed berries and sliced berries separately for at least one hour. In a deep, chilled bowl, whip cream, sugars and vanilla with a whisk or hand mixer until soft peaks form. Add sour cream and whip until stiff peaks form. Serve immediately. I don’t think these should really even be considered cupcakes – they’re just astonishingly rich. Which is awesome. But I think they probably work better as individually-sized flourless chocolate cakes. I imagine they would rock with some raspberry sauce drizzled on top. I found the recipe here. I bought all of the ingredients for the accompanying frosting, but I can’t imagine the sugar shock the combo of these things and frosting would induce. They’re pretty easy to make, but there’s a lot of waiting and you have to make sure you have room available in the fridge. Heat oven to 300° F/150° C. In a small saucepan over medium heat, combine water, salt and sugar until everything is dissolved and set aside. Melt the chocolate and pour it into the bowl of an electric mixer. Cut the butter into pieces and mix it into the chocolate one piece at a time. Next, beat in the hot sugar water. Finally, beat in the eggs one at a time. Gently fold in egg whites until just combined. Pour batter into lined cupcake tin (it must be lined – these will not come out without cupcake papers), filling cups about 3/4 full. Place cupcake tin in a larger pan and fill the larger pan halfway with boiling water. Bake cupcakes in their bath for 30 minutes. Remove from oven (centers will look wet) and let them rest for about 15-20 minutes, then put the cupcake tin in the fridge. Don’t remove cupcakes from the tin until they’re cold – otherwise they may lose their shape.